- 15 % discount for minimum 6 overnights stay. 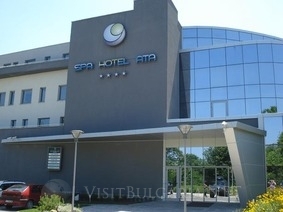 ATA Spa Hotel is the first luxurious Spa Center in the town of Varshets, which offers full range of spa - services. The hotel unites exquisite design and high standards of functionality. Spa & wellness: ATA Spa Hotel delivers exceptional SPA services to every client - a pleasure that exceeds all expectations. From the therapy that we offer, trough the products that we use, the lighting, music and aromas in the SPA Center - every detail is special and carefully selected and brings unique experience to each guest. Whether you prefer a short rest from the stress of the daily round, all day SPA program or a romantic weekend for two, ATA Spa is the right choice, because here everyone is a special guest! Wine & dine: Taste the authentic culinary temptations of our Chef, surrounded by exquisite atmosphere. You will enjoy the combination of fresh products, original recepies, and elegant serving that will make every bit a true delight. The restaurant in SPA HOTEL ATA has 90 seats and the garden has 50 seats. Lobby Bar: Make yourself comfortable in the Lobby Bar and have a cup of coffee with rich and pure taste or a soda, while you are having a conversation or waiting for your friends. Meeting facilities: The hotel offers a conference room with 50 seats and a meeting room for up to 8 people. Leisure: Varshets is a wonderful place for rest, sport, climato-treatment and balneo-tretament. Varshets is situated near venerable forests, whimsical rock formations, and beautiful and diverse landscapes of the mountain crown Koznitsa. This makes Varshets a convenient destination for different types of tourism. The rates are in EUR, per night, per room/apartment. Please use the booking form to get a price for your period of stay, number of persons and meals included.